Has much changed with Asia and international competition? Is China in the 21st century what Japan was in the 20th? Professor Robert Wood of San Jose State University joins Ray Zinn in a conversation about trade with Asia, then and now. Robert Wood: Hello podcast listeners this Robert Chapman Wood. I’m professor of Strategic Management at San Jose State University in Silicone Valley, and I’m today’s guest interviewer on the “Tough Things First” podcast. We’re building on Ray Zinn’s book, “Tough Things First” and we’re going to talk about one really tough thing today, and that’s US-China business relations. Ray Zinn: Sure, and thanks a lot, Robert, for joining us on this podcast it’s a real honor to have you and your expertise to talk about this important subject. So as I think about, of course, I hate to give away my age, but I was born during the depression era, and at the beginning of the Second World War. So I’m very familiar with what happened after the war and what Douglas McAurther wanted to do to help Japan. And of course, he got Japan economically on its feet. The way, of course, that any economics work there’s a, what they call the first law of economics, which is: Individual A benefits from Individual B as long as Individual B’s loss is less than Individual A’s gain, is considered a good economic principle. The thinking was, Japan’s going to benefit from the US helping get Japan on its feet and then because it’s a small cost to the US, but a big gain to Japan. Well, Japan, these are very bright people, and the Japanese are very innovative, and they jumped right in, and we used to laugh, and we used to look at the products that would come from Japan, they were like Tinker Toys. I mean they were really just cheapy things. We used refer that’s Japanese quality, you know as we used to say it that way, but in order to build product that the US would consume, they had to build very quality products. And they learned how to do that; they learned how to do it very well. In fact, the Japanese became at building quality products than the US was. So let’s back up for a minute. The US is what we call the great consumer, and the entire world the US is the sugar daddy, and so that’s why our balance of payments are so hugely offset in a negative way, is because we consume more than we export. In other words, we import more than we export. And it all started with this getting Japan on its feet and also getting Germany on its feet. So it wasn’t just Japan; it was also helping Germany. And you know they recovered quite well, so the problem, now I’m just going to jump forward to the Sixties that we began to face, from Japan was, is that in any country when you know, they’re trying to build their economy become very protectionistic. And so if you recall, Robert you studied over there, you were a journalist over there. You know they’re very protectionistic, and so they had the national finance group called Minute, called Many, MIDI, MIDI I’m sorry. Ray Zinn: They were very defensive, and they made it easier for their manufacturers to do business against the US. So the products were cheaper because they helped, the government of Japan helped the companies. And so, in our country here in the US we’re less that way. We don’t really help the manufacturers. We tend to let everybody; you know a capitalistic society run on its own. So my problem, when I was running Micrel in the late 70’s early 80’s and Japan, was their very protectionistic and it was difficult to get them to buy our products because they put you through all these hoops that you had to go through to buy. You had to go through middle man; it was just the companies really favored Japanese products or Japanese manufactured products. So that’s what I ran into Robert, does that kind of match your experience? Robert Wood: Yes. Did you have a lot of Japanese competitors? Ray Zinn: I did, but not a lot. It wasn’t- I shouldn’t say a lot. I had some, but not a lot of Japanese competitors, but the problem is that it’s not what you know; it’s who you know in Japan. Robert Wood: Right. Mm-hmm (affirmative). Ray Zinn: And so you had to know people, you had to, you actually had to, I don’t want to say pay them off, but you had to somehow or other is a quid pro quo. Robert Wood: Before they would buy from you. And it was a lot more difficult for an American company to develop the serious relationship than it was for Japanese company. Ray Zinn: Perfect, that’s exactly what I meant. Robert Wood: Does your Japanese competitors try to get into the US market? Ray Zinn: Oh yeah, absolutely, I mean they did, and it was in a Toshiba was the classic. They were, they were buying some semiconductor companies they were helping start up some semiconductor companies. Robert Wood: In the United States? Ray Zinn: In the US, and then they would transfer the technology to Japan. And so, because Toshiba was right across the street from me, like 100 feet away. So I had first-hand knowledge of that, and I could see what they were doing, and the Japanese have a totally different style of management than we do in the US. And so, it was just interesting to watch the US engineers dealing with the Japanese philosophy of business. Robert Wood: One of the things that I found when I was trying to help an American company export to Japan was that the Japanese would come in and they would really want to buy, it was no question that they wanted to buy, but they would say stuff in English and then I would say the same stuff in English and then in English that the American’s would understand and then the Americans would say stuff in English and the Japanese would have this blank look, and then I would say the same stuff in English that the Japanese would understand and somehow the deal got done. It is really, truly a different cultural experience, and they knew how to run an economy at that time. This was the 19, late 80’s early 90’s they were doing very well. Now the interesting thing is that America came out of that struggle with Japan pretty well. Were you able to develop a positioning that gave you a good long term situation from all of that? Ray Zinn: Yeah, it, actually yes. As they say, “Things take time.” And it looked like that was what about a 10 to 15-year cycle that we went through to get things straightened out with Japan so, but Japan is not the threat that they were in the past. It’s more Korea and China. Ray Zinn: To our industry anywhere are more of the threat technologically speaking. Japan has their own problems, but the balance of payments of kind of reconcile themselves between the US and Japan. But we have the opposite problem with Korea and China. Robert Wood: Yeah, what I’m looking for though, is I mean how did Micrel ultimately cope with this big Japanese threat? How did you come out of it, because as we look at the Chinese threat, we can look back on how we did with the Japanese and say, ” We did okay there.” How did Micrel finally develop a positioning that was a good long term situation? Ray Zinn: And that’s kind of how it took care of itself in a way because their costs became almost equivalent to ours. Robert Wood: Yeah. So how does the situation between China and the US today compare with the US-Japan situation back then? Ray Zinn: More expensive here than there. And so China is not exporting manufacturing they’re still importing manufacturing. Apple and other large electronic firms are doing that. So what happened was in say the middle of 1990, 1995 in that time frame China wasn’t really much of a technological threat electronically. But then we had that Y2K problem, and you know we overbuilt. That was back in the days when Al Gore claimed he was the inventor of the internet, and so the technology, the inventory increased dramatically to the point where companies like Nortel and IBM and others who were manufacturing here in the US, they were way overbuilt and so they had to shut those plants down and just coincidentally China was at the same time making some big moves to try to gain a foothold in manufacturing and they did an in run on us by setting up very inexpensive manufacturing in China to the point where the government was really helping. They built the buildings, they basically total infrastructure, everything, they just completely dominated other countries and building for these large telecom companies. And so in 2010 just eight or nine years ago China really started dominating electronic manufacturing, and that’s one of the big imports that the US has is in, consumer anyway, is in electronics. And so they have really benefited, you know Apple being one of the largest companies in the world now really benefited from the Chinese manufacturing and getting that technology incorporated at a low cost and then bring it into the US and that really helped the Chinese also. And so they saw, or they see that developing semiconductor technology is key to electronics because semiconductors are the heart and soul of electronics. And so it’s really hurt our industry the semiconductor industry because the Chinese have said that by 2025 they want 90% of all semiconductors manufactured in China. And that includes the products that they’re going to assemble for people like Apple. Robert Wood: Right, and the products they’re going to design to dominate other sectors as well. So what are the most important steps US businesses should be taking to deal with this kind of challenge? 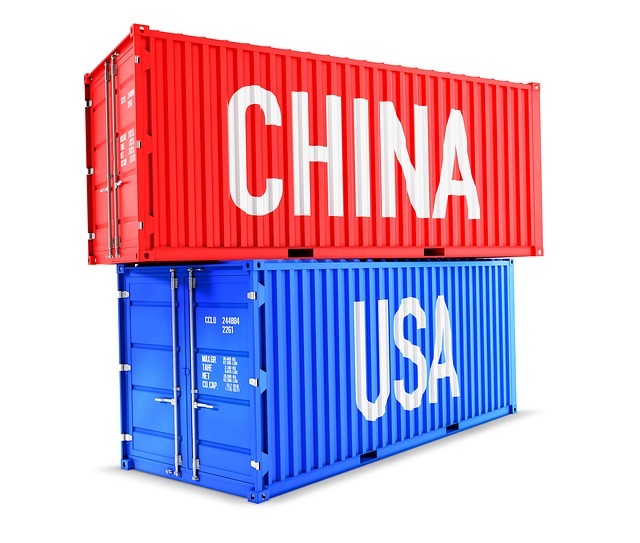 Ray Zinn: Well I think as abrasive as this sounds, I think this thing with tariffs that President Trump is doing is at least a stop gap to slow the juggernaut down, and we’re seeing that impacting China, I heard on the radio today that China’s economy is slowing. So is Germany so these tariff’s are having an impact on two of our largest competitors, word competitors, Japan, I mean China and Germany, and their economies are beginning to feel the brunt of it. So as much as we hate to say this, tariffs do level the playing feel to some degree, and slowing down the balance of payments is key to doing this because you’ll effectively slow down China from being able to execute on their 2025 goal of supplying 90% of all semiconductors. Robert Wood: Yeah. How would we as Americans like to see the US-China relationship develop? What would we like to see go from here? Ray Zinn: Well, I think if China will develop a more democratic society. If they’re a little more amenable to buy, abiding by international trade, I mean international Pattens and honor this whole concept of IP, intellectual property. I think that will go a long ways to mending the relationship between the US and China. Because China’s looked upon as being dishonest, as being you know willing to cheat and to steal technology. And of course, that irritates the US manufacturing. Robert Wood: So there are, I’ve heard, some American companies that have made some progress in getting their IP more honored in China than it had been. I heard Microsoft has made some progress around that. Do you think that it’s possible for other companies to actually do that? Ray Zinn: Well if you look at the size of Microsoft compared to some of these other smaller companies. Microsoft has the horsepower to do it, and I’m not sure that China looks at Microsoft as being a big competitor. So the ones that I think are going to be concerned are the companies like Apple, who are, and Cisco who are 100% dependent on China for manufacturing. So if Apple will move their manufacturing to other countries, even, like Malaysia or India. India is much more amenable to honoring IP than China is. That will then I think bring Cina to the table saying, “Well we better play ball here, or companies like Apple are going to be forced to go to other countries like India to get their manufacturing done.” And that would really hurt China. So China, China they’re smart enough they recognize the clout of economics, and I think it’s a game of economics. In other words, you’re going to lose all of this business China if you don’t play ball. Robert Wood: I had personal experience with, I would have to call it IP theft in India. I’m sorry in Japan and Korea when I was a journalist there. Have we made progress on getting our IP respected in the countries in Japan and Korea and Taiwan and Malaysia the countries that are a little more developed than China is? Robert Wood: Korea is very, very intelligent people, very, very creative and Korea is a threat. I mean they have the same goal [crosstalk 00:20:32] Korea’s a healthy country now, I’ve been there, and it’s quite remarkable how, you know as a journalist I toured one steel mill in the 1970’s, and I toured the same steel mill even in the late 19190s, and the dramatic change was absolutely credible. So Korea is beyond threat it’s like as wealthy as man European companies now. Ray Zinn: Absolutely and now it’s because during the Korean war, we, The United States wanted to go in and help Korea build up its economy. That would have helped in Vietnam had the United States stuck with it or tried to at least the North Vietnamese from taking over South Vietnam because we would have done the same thing there as South Vietnam would have become politically and economically stronger, but we did that as you know in Korea. We were able to pull that off, and we built, we actually helped the South Koreans be more independent. Because that’s the whole goal of the United States is that we help you become independent, we did it in Germany, you know we did It in France. We’ve helped England. You know where the great helpers. We’re the great; we like to help other countries, not even all our citizens understand that. The united states is quite philanthropic int hat way. We do help underdeveloped and less fortunate countries. Robert Wood: So what would cause the Chinese to act in ways that would really benefit not just us, but people throughout the world economically? Good trade is good for people, and the question is, “How do we get to the point where we feel good about Chinese Trade? Ray Zinn: Okay so again we’ve got to get China to understand the power of economics. Economics is the great healer of all things, as we talked about when we started this podcast that if China feels the economic effect of our tariff’s and sees that if they don’t play ball, you know that they’re going to suffer economically, and they’re beginning to already, as you know Robert, China if you look at the stock market it’s being impacted by the slowdown primarily in Germany, but also in China. And so there’s been some great investments made in both Germany and China, and those investors are concerned because the US is tightening down. We’re saying, “Play ball or you’re going to lose.” And because we are economically so strong the US is the strongest nation in the world economically we have the clout and you know we will vote with our pocketbook, and so we need to bring the Chinese to the table and the only way to do that is to say, “Okay, if you don’t want to play ball here’s the consequences, and unfortunately that’s what it takes some times, is you just have to threaten and do what you have to do to balance the playing field. Robert Wood: Yeah. Very credible.